I particularly enjoy when luxury watch manufacturers get involved in issues near and dear to my heart. And one of these concerns working toward improving our world’s view of and interaction with environmental issues. This is something that affects all of us, and raising awareness is now more important than ever. As announced at Baselworld 2018, Breguet supports and collaborated with a foundation that works toward preserving the earth’s water for a year now. Race for Water, as the Swiss foundation is called, creates and implements innovative solutions for stopping plastic waste from entering the marine environment and dealing with that which is already unfortunately here. Breguet has committed to supporting a five-year Race for Water program called Odyssey 2017-2021, which involves a pioneering vessel sailing around the world in order to raise awareness and educate the general public, in particular the younger generations. 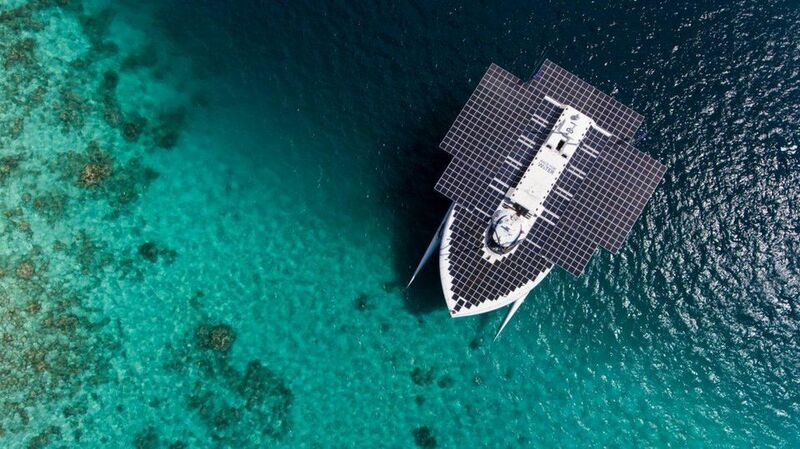 The Race for Water vessel, which is powered by energy won from hydrogen, kite (wind), and solar, demonstrates that clean energy is a reality. The boat, which left Panama in March 2018 and has traveled to Peru, Chile, Rapa Nui (formerly known as Easter Island), French Polynesia, Samoa, and Tonga among others, has welcomed thousands of children among its guests on board. Why does Race for Water exist? Because the plastic that has polluted our oceans for years now has turned into micro particles that permeate all oceanic (and therefore all) life. And only one percent of plastic in the ocean is visible on its surface. If that doesn’t scare you, it should! Water is the beginning and the end of all life on earth – and plastic permeating it is a genuine environmental disaster. The Race for Water foundation works toward preserving the oceans and protecting them from plastic waste. In a nutshell, Simeoni’s organization has come up with a technology capable of transforming plastic waste into electric energy. “The sale of this energy will allow the community to pay the street collectors and encourage them to pick up end-of-life plastics.” During the vessel’s stopover in Rapa Nui, Race for Water signed agreements with the Chilean island’s authorities managing its electricity production and distribution. This chiefly concerns implementing Race for Water’s Biogreen 300 technology, which enables the island’s plastics and waste to be converted into energy. The aim is to provide a sustainable and effective solution for Rapa Nui by 2020, where daily plastic pollution washing in from the South Pacific’s “trash vortex” and the indigenous creation of it is an enormous problem for the small island with about 7,500 inhabitants and 100,000 tourists each year. PBS reports that the island’s growing population produces more than 20 tons of garbage each day! See the intriguing video of Race for Water’s 2018 visit to Rapa Nui here; these are five minutes of your time more than well spent. While Breguet’s support of Race for Water is commendable in a global sense – and I wish more watch brands would take such action to help improve things in and for our world – it also fits the brand’s own fabric, in particular the very masculine Marine collection. See more about these models in New Breguet Marine Models: All Hands To Battle Stations!, Battles Of Breguet Part One: Conquest Of The Seas, and Breguet Marine Alarme Musicale 5547: Keeping Technological Traditions Alive.